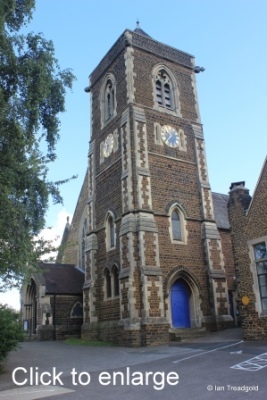 The church of St Barnabas is situated towards the south-west of Linslade which makes it fairly central within the confines of the Leighton Buzzard – Linslade conurbation. 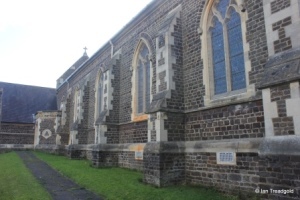 Parking is available in the church car park. 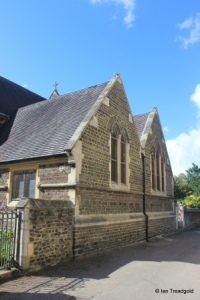 The original village of Linslade was situated around the church of St Mary to the north of the present town. 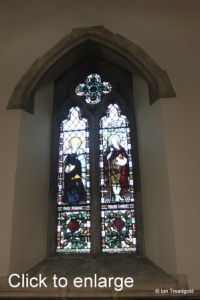 With the coming of the canals and railways the population moved to the town’s present location and indeed the church is close to the railway station. Until 1965 Linslade was in Buckinghamshire and in ecclesiastical terms was administered as part of the Diocese of Oxford only transferring to the Diocese of St Albans in 2008. 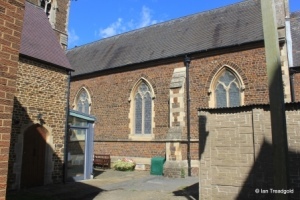 The church of St Barnabas was built in 1848-9 as a simple nave, chancel and north porch. 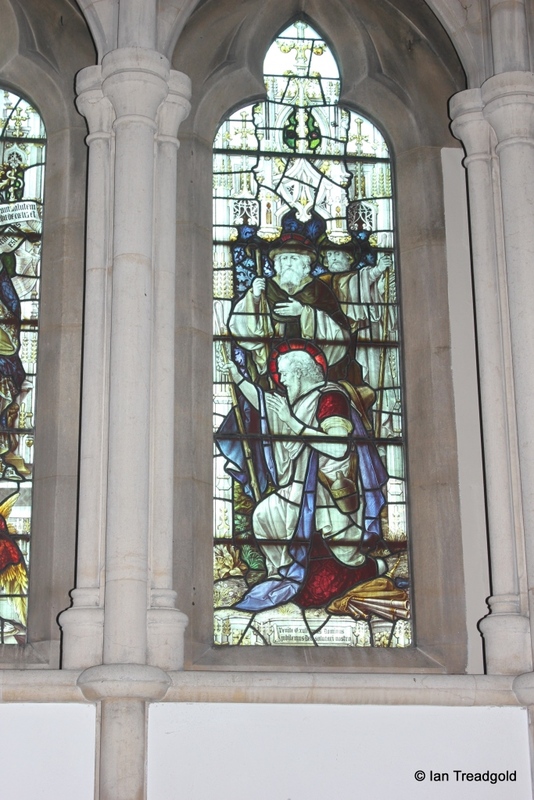 During the 1860’s it became necessary to extend the church and the south aisle and west tower were added with completion in 1869. 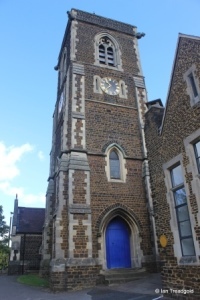 At this time, the bells from St Mary were transferred to the new tower and the existing bell turret moved to Billington where it still stands. 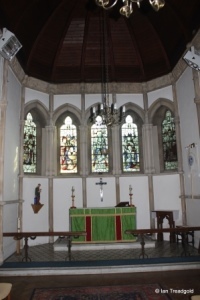 Further extension took place in 1905 with the addition of the Lady Chapel and part of the north aisle. 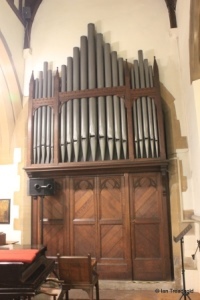 The aisle was completed in 1913 and further work done to extend the chancel eastwards took place in 1914. 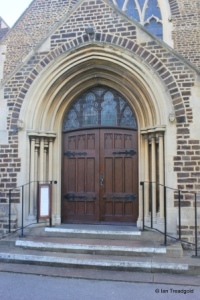 In recent times, a link from the south door of the church to the church hall has been completed. 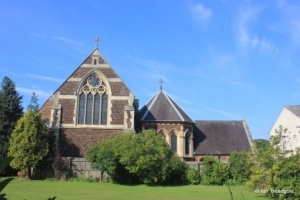 One of the challenges of St Barnabas is the size of the overall site and the proximity of neighbouring buildings and roads combined with the link between the church and the church hall and parish offices. 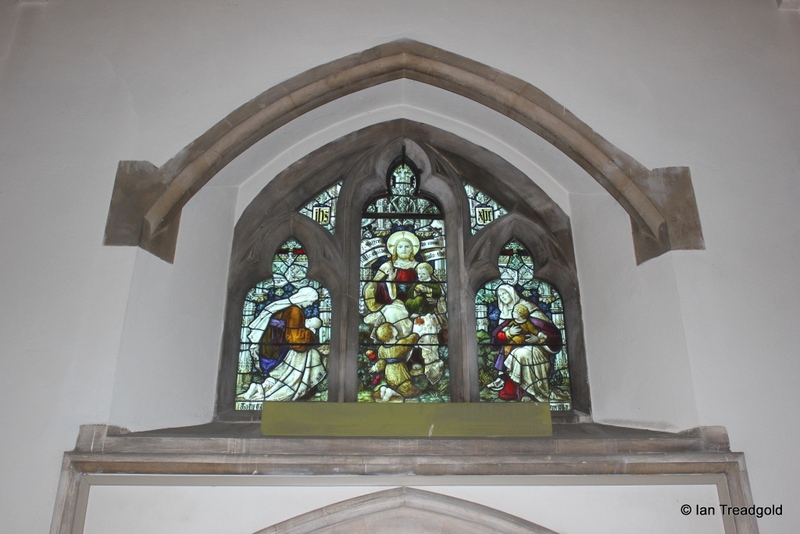 The south aisle is quite hidden from view and now contains three windows, each of two trefoiled lights under a pointed arch with differing tracery in the heads. 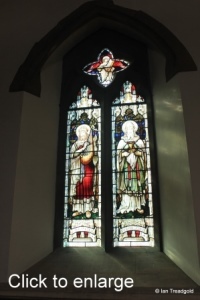 There were originally four windows on this aisle but the western was removed when the link between the church and church hall was added in recent years. 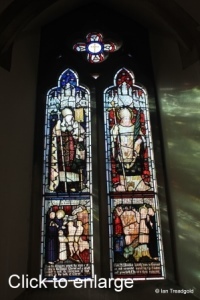 The glass in the four windows dates from 1882 and is by CE Kempe and came from Chapel of Ely Theological College in 1994. 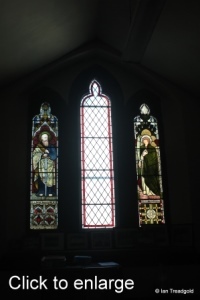 The glass depicts, from the east, St Gregory and St Boniface, St Patrick and St Columba, David and Melchizedek, and in the fourth window now in the vestibule between the church and church hall, Victorian missionaries John Patterson and Charles MacKenzie. 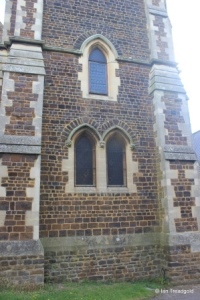 The tower is unusually built onto the west end of the south aisle instead of its more usual position at the west end of the nave. 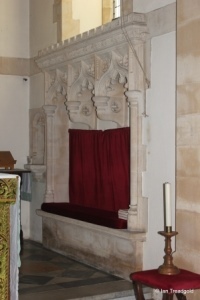 There is an outside door to the south and an internal stair form the south aisle. 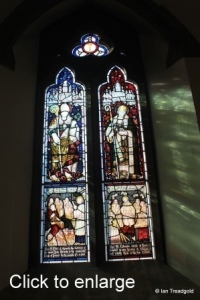 There are plain single light windows to three sides with a pair of single light windows to the west. 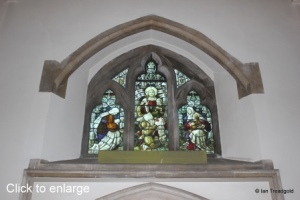 The belfry openings are of two lights with an encircled cinquefoil design above under a two-centred arch. There is a clock face on each side of the tower. The tower is capped by a pyramid roof. 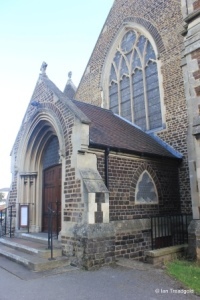 The porch was clearly added to the west end of the church in the later extension works as it impinges on the west window. 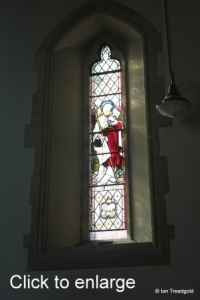 There are multifoil windows to each side and the door is accessed up three stairs. 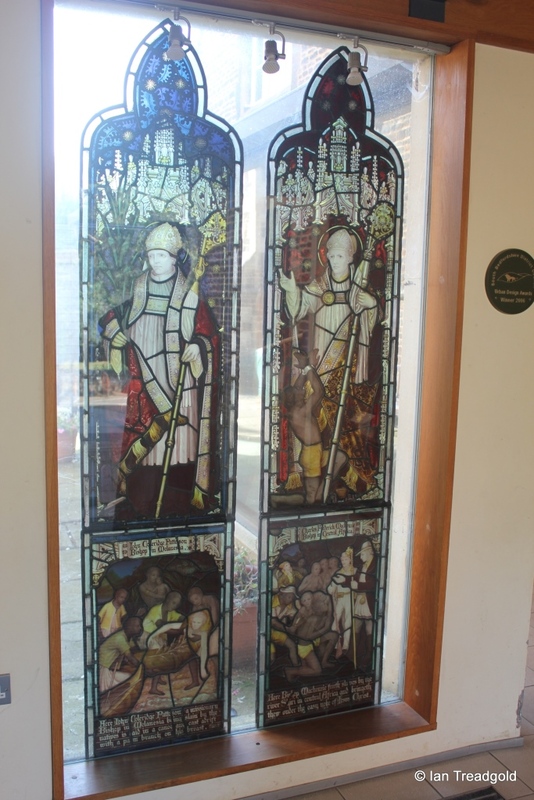 The double doors are surmounted by stained glass panels under the large two-centred arch. 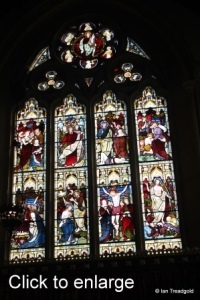 The west window itself is of four lancet style lights with subordinate trefoils. 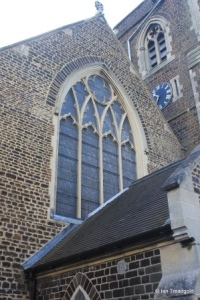 The tracery above features an encircled quatrefoil all under a pointed arch. 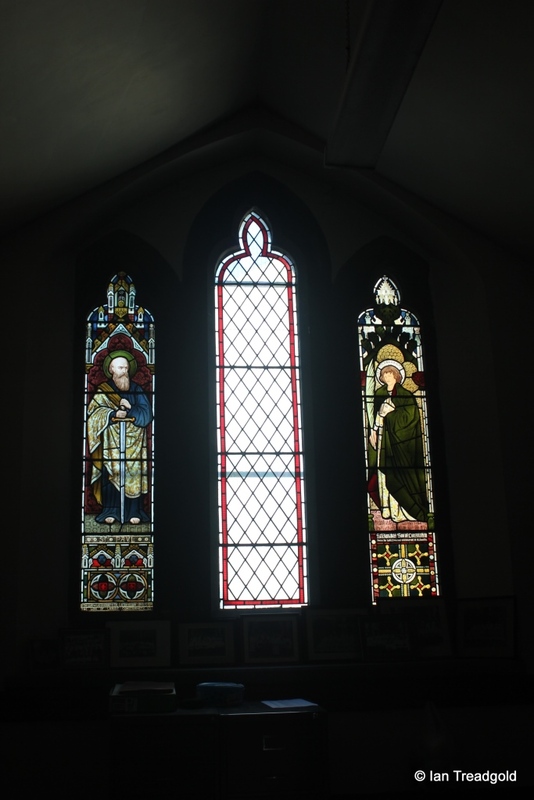 The glass shows St Birinus of Dorchester in Oxfordshire, St Osyth of Aylesbury, St Hugh of Lincoln and St Frideswide of Oxford. 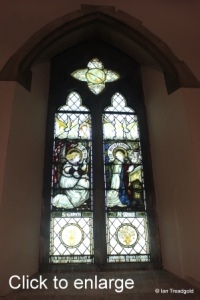 The glass in the window dates from 1914 and is in memoriam of Charlotte Simpson who was a major benefactress of the Church with bequests from her estate. 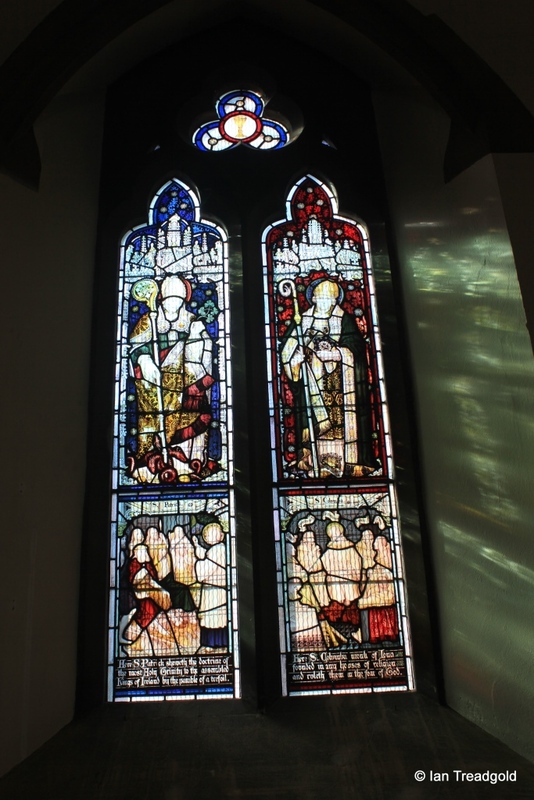 The north aisle has a west window and four windows on the north side leading to the north porch and door. 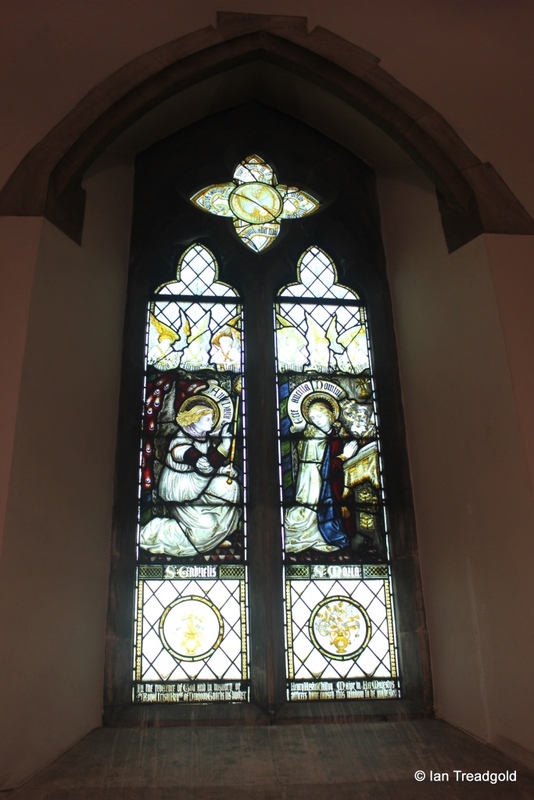 Each of these windows is of two trefoiled lights under a two centred arch. 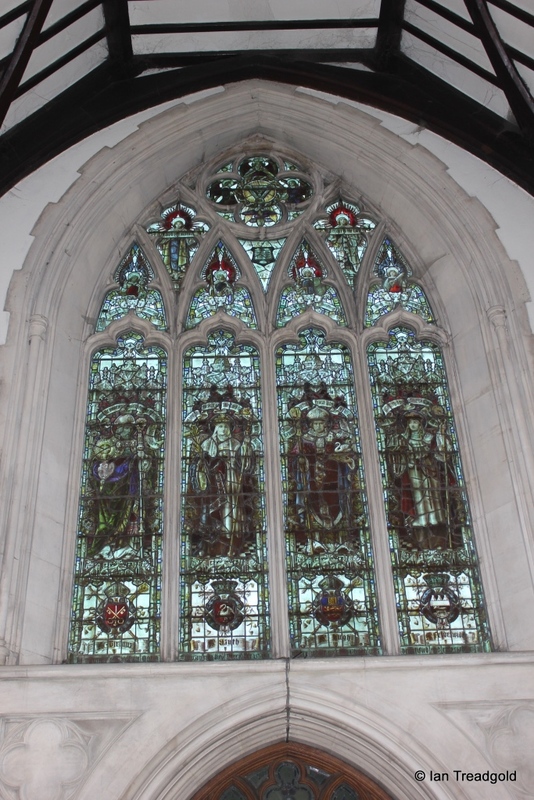 The tracery above the lights are variations on quatrefoil designs. 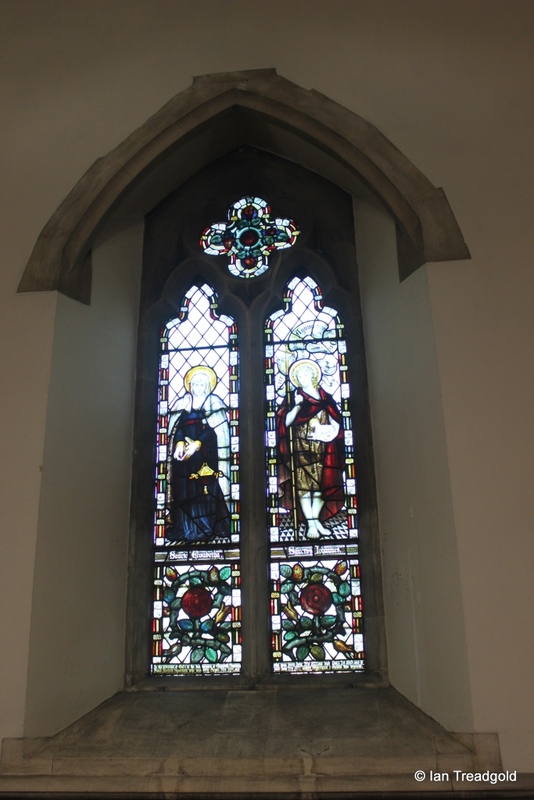 The western window shows the patron of the church, St Barnabas and St James the Great and dates from 1923 in memory of Elisabeth Hadley. 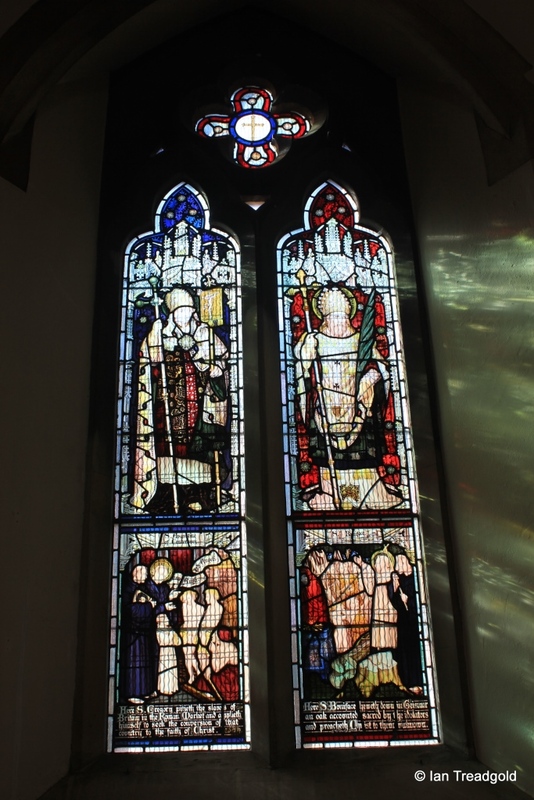 Other windows on the north aisle show St Elizabeth and John the Baptist, St James the Less and St Barnabas, and St Gabrielis and St Maria dating from 1877 in memory of Henry Chilton of the Royal Irish Regiment of Dragoons. 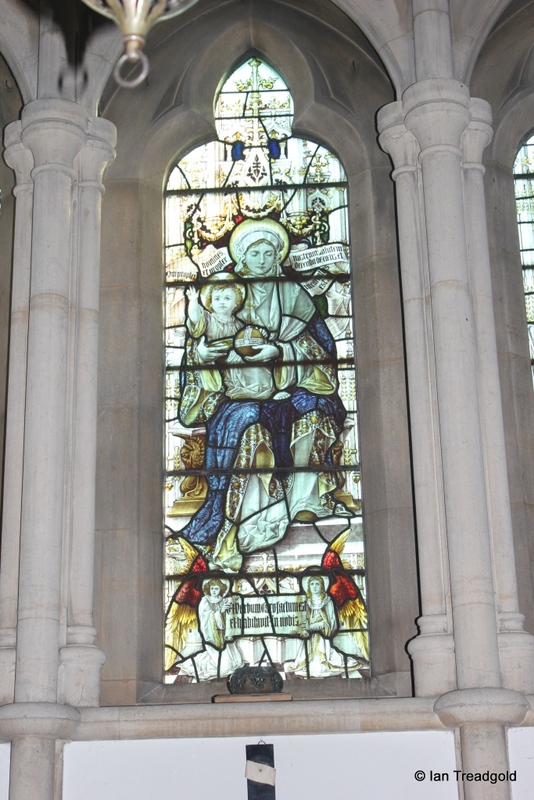 The glass over the north door takes its inspiration from the bible “Suffer the little children to come unto me” and was erected in memory of Lucy Theobold in 1909. 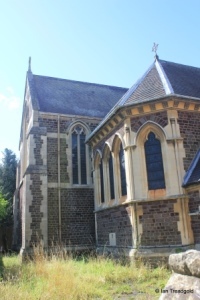 The outer wall of the vestry rooms beyond the north aisle form the boundary of the church grounds. 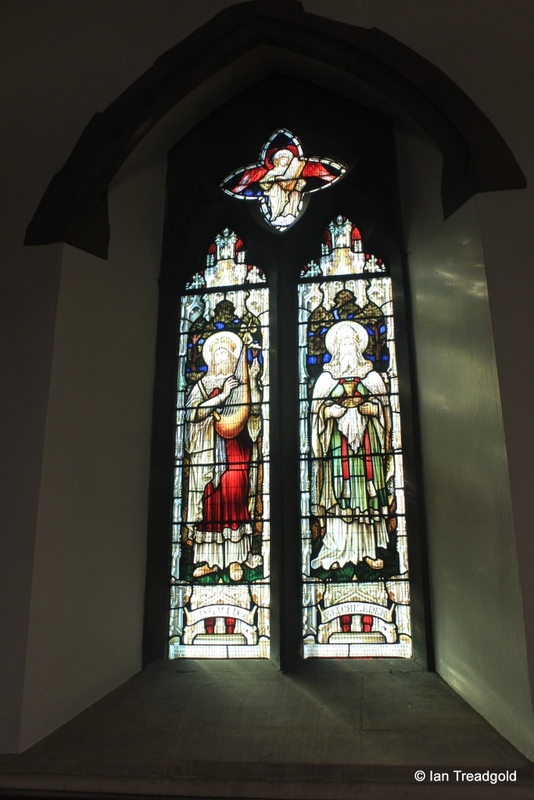 There are two windows, one of three lights and one of two. 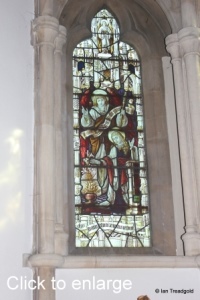 In the Choir Vestry the glass depicts St Paul and St Barnabas and dates from 1874 having been raised in memory of the Lenten mission services. 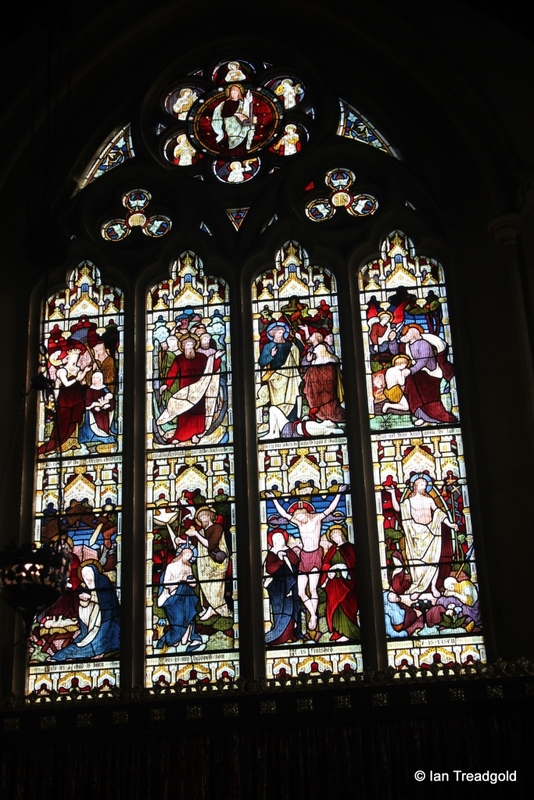 The east end of the north aisle is formed by the Lady Chapel and has an east window of five conjoined single light windows. 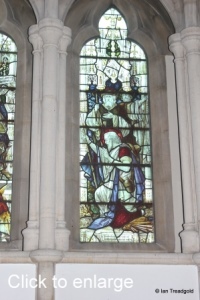 These panes depict scenes covering the annunciation of the Virgin Mary, the adoration of the Magi and the presentation of Christ in the Temple. 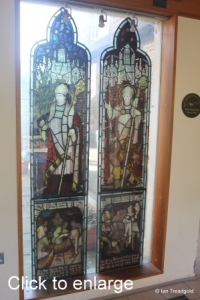 This glass dates from 1905. 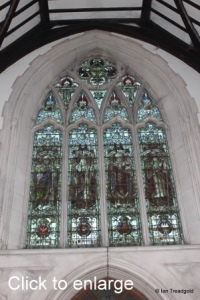 The east window is of four lights with geometric intersecting tracery above under a two centred arch. 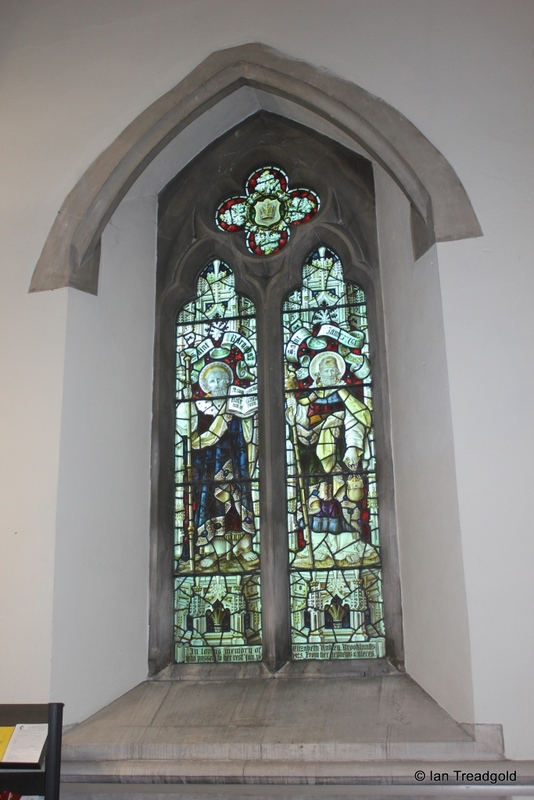 The glass was erected by James Hadley in memory of his daughter Elizabeth who died in 1872. 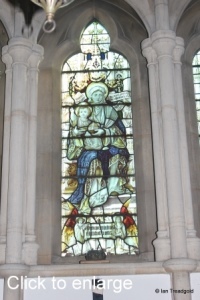 There is a suggestion that she is pictured within the glass in the circle at the top of the window. 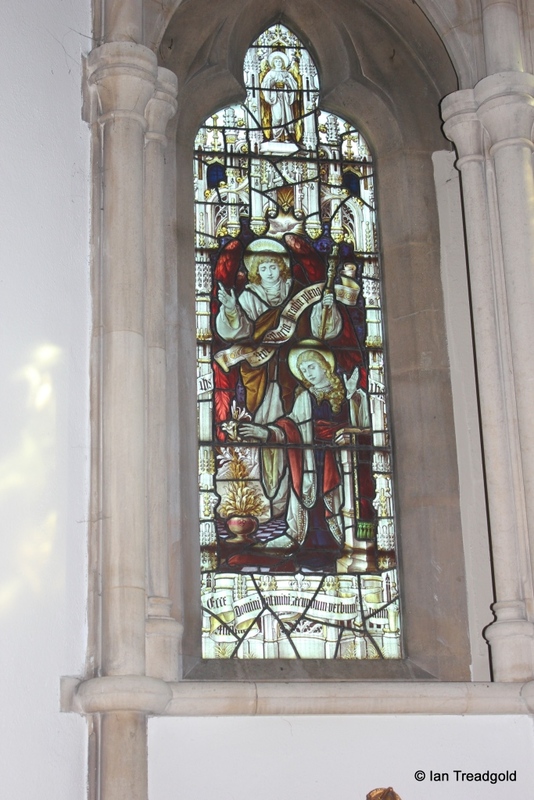 The glass depicts scenes from the life of Christ; his birth, baptism, crucifixion and resurrection. 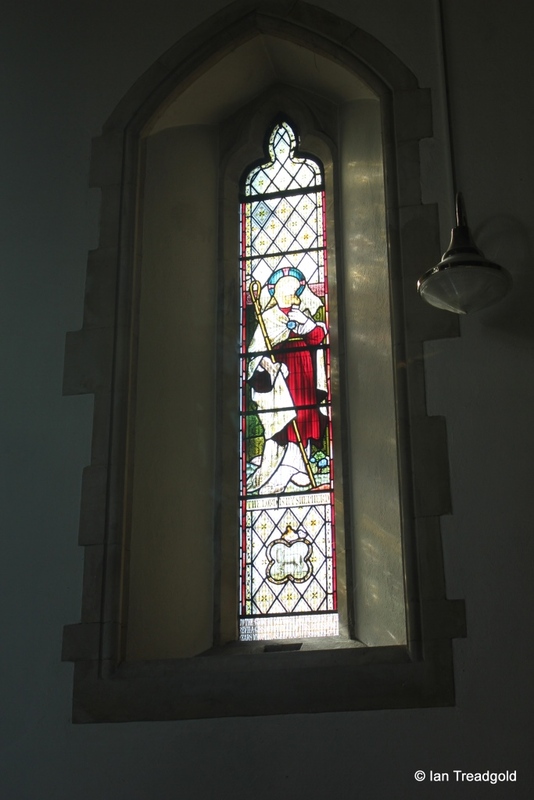 On the south side of the chancel is a single light window depicting The Good Shepherd in memory of Rev HA Gibson who died in 1880 aged 47. 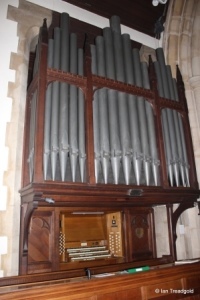 Inside the church, the impressive and recently restored organ occupies the east end of the south aisle and the first bay on the south side of the chancel. 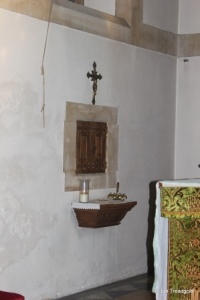 Surrounding the altar are a three bay sedilla and piscina in the south wall and an aumbry on the north wall. 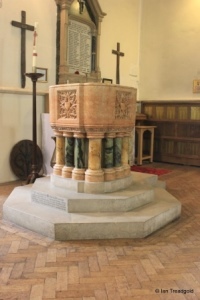 The font was installed in 1913 and is of Verona red marble with Connemara green marble columns. 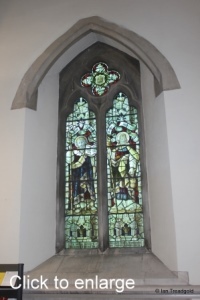 It was installed in memory of Douglas Hurst-Jones who was curate and vicar of the parish at a cost of £100.